Amazon has defended working with US police forces to provide facial recognition technology, amid concern from civil rights groups. The American Civil Liberties Union (ACLU), and others, said the retail giant's Rekognition software guide "read like a user manual for authoritarian surveillance". But Amazon said "quality of life would be much worse" if technologies were blocked because of how they could be used by others. It said the tech had in the past been used to find lost children or other people of interest - and had great potential for fighting crime in future. Through a freedom of information request, the ACLU was able to obtain emails sent back and forth between Amazon staff and law enforcement agencies in the states of Oregon and Florida. In Oregon, the tech was powered by a 300,000-person database of mug shots that powered a mobile app. Officers could use the app to cross reference people's faces with any criminal record. The emails also discussed the integration of this technology with body cameras used by police. "Applying facial recognition to body cameras would absolutely transform those devices," argued Matt Cagle, technology and civil liberties attorney for the ACLU in California, speaking to the BBC. He explained that the argument given for adopting body cameras was to make police offers more accountable for their actions. "This would turn those devices into surveillance machines aimed at the public," he added. The system makes use of Amazon's cloud computing platform, Amazon Web Services (AWS). The technology was not a secret - Amazon had published details of its work with police on its AWS blog. But in response to a joint letter sent by the ACLU and 33 other groups, Amazon defended its partnerships with law enforcement agencies. 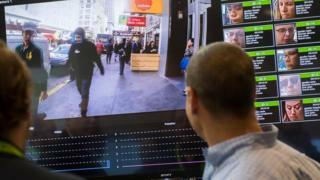 It said fears over misuse of the technology should not inhibit use of facial recognition to fight crime. "Our quality of life would be much worse today if we outlawed new technology because some people could choose to abuse the technology," Amazon said in a statement. "Imagine if customers couldn't buy a computer because it was possible to use that computer for illegal purposes?" The ACLU's Mr Cagle said he believed Amazon was entering the surveillance industry without proper consideration about how this technology could be used in future. "When powerful surveillance technologies are deployed it is difficult and often impossible to undo the harms once those technologies are deployed in communities. "And so we're very concerned that Amazon appears to be rushing into this surveillance market with and with no meaningful restrictions to limit how governments can use this and local governments themselves and local law enforcement are not adopting their own restrictions." The debate over the implementation of facial recognition software is happening all over the world. In China, three wanted criminals have been arrested while at pop concerts after facial recognition spotted them as they entered the venue. Some point to the technology's limitations as a reason not to use it for law and order, including its shortcomings when accurately identifying people of colour.